OVERKILL have been around for over 20 years and 14 studio albums, and they're sounding pretty damn good on their latest opus, "Immortalis". One of the leading lights of the New York/New Jersey thrash scene of the Eighties (which included ANTHRAX, NUCLEAR ASSAULT, WHIPLASH, CARNIVORE, BLOOD FEAST and numerous others), OVERKILL was a staple at legendary clubs like L'Amour, playing a Gothic-tinged, streamlined and catchy style of thrash/power metal distinguished by the gritty vocals of frontman extraordinaire Bobby "Blitz" Ellsworth. Signing with Megaforce, the group got its chance to spread its wings first over the rest of North America and then the world, releasing acclaimed discs like "Taking Over", "The Years of Decay" and "Horrorscope". There have been quite a few label and personnel shuffles since then, with only Ellsworth and bassist D.D. Verni remaining from the original lineup, but the band has stayed consistent in both its approach and its style. "Immortalis" is a classic-sounding thrash metal album, old-school in its appeal and production, with Ellsworth screaming as ferociously as ever and the guitars having a razor-edge rawness that's sort of both nostalgic and refreshing at the same time. If it occasionally comes up generic, it's only because the band itself has stuck to a traditional groove this time out, staying away from the experimentation of some of its previous albums. The record kicks off in hyper mode with "Devils in the Mist", featuring some crunching guitars courtesy of Derek Tailer and Dave Linsk, while Blitz gets right down to business with a sturdy combination of his high-pitched growl and some piercing screams. The anthemic "What It Takes" follows with an arsenal of stop-and-start riffing before leading into "Skull and Bones", which features LAMB OF GOD's Randy Blythe on vocals. The latter's growl is powerful and ominous enough, but actually helps to emphasize how original a singer Ellsworth is. The song is bolstered by newest member Ron Lipnicki's galloping drums and Verni's flexible, rumbling bass, which tends to get overpowered in the mix throughout the record but manages to make its presence felt. 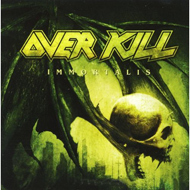 OVERKILL has altered its style over the course of 13 previous full-length efforts (not counting EPs and such), adding different genres of metal into its sound (retro, industrial), but "Immortalis" is about as time-honored an album as you expect from the band. There's nothing essentially new here, and some of the tunes stand out more sharply than others, but there's still a clear energy and fire to the band's playing that is enjoyable to hear after all this time. The biggest but not fatal letdown is closing track "Overkill V", which doesn't hold up to earlier installments and goes more for atmospherics at the expense of being a good tune. For a band with its history and sizable catalog (they were the first of the original thrash metal acts to complete ten studio albums), despite never having achieved what one could consider "mainstream" success, OVERKILL is still making the music it does best — if for those reasons alone, "Immortalis" is a more than appropriate title.